Key stat: Lock’s TD-INT ratio against non-conference teams in 2018 was 14-1 in five games. In eight games against SEC opponents, that ratio was 14-7. The skinny: The Missouri-bred Lock emerged as a high-profile recruit for football late in his prep career, and there was some buzz he even could attempt to play college basketball as a shooting guard as well. As his recruitment went on, Lock drew serious interest from college football heavyweights such as Texas and Ohio State. 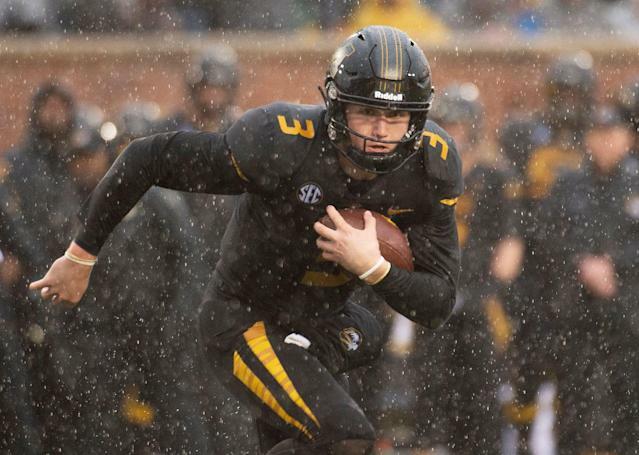 But the son of a former Mizzou offensive lineman stuck close to home to play for the Tigers. Lock started 50 games in his Mizzou career, including eight of 12 during an especially tumultuous season surrounding the program as a true freshman in 2015. He emerged from that year battle-tested, improving by leaps and bounds from the start of the 2016 season to the end of the 2017 campaign. Running Josh Heupel’s spread offense, Lock threw for a combined 67 TDs and 23 interceptions, leading the SEC in pass yards in 2016 and FBS in TD passes in 2017. In 2018, Lock returned to school and was named second-team all-SEC in throwing for 28 TDs and eight picks and improving his completion percentage to a career-high 62.9 under former NFL assistant Derek Dooley. Lock played at the 2019 Senior Bowl and consistently looked sharper in practice next to Duke’s Daniel Jones, N.C. State’s Ryan Finley and Penn State’s Trace McSorley (although Jones was named offensive MVP in the game itself). Lock, who turns 23 in November, led the Tigers to two bowl games which the team lost. He also had nine career rushing TDs (including six as a senior) and caught a 21-yard TD pass vs. LSU in 2016. Upside: Top-shelf arm talent who can spray passes all over the field. Even with an elite deep threat in Emanuel Hall, Lock rarely underthrew his downfield targets and often could get the ball there with a quick, easy delivery. He flicks the ball with ease and can throw ropes into tight windows with natural three-quarters delivery. Lock was successful on vertical shots even against two- and three-deep zones, occasionally surprising defenders with his velocity and placement. He has a fearless approach in taking shots and rarely gets picked downfield. Even with a dip in his statistics from 2017 to 2018, Lock became a better quarterback. Dooley and his staff drilled into Lock cleaner mechanics, faster processing and knowing when to take checkdowns or burn the ball into the turf. (Lock spoke at the Senior Bowl about how much he learned watching cut-ups of 50 Tom Brady throwaways that Dooley provided for him.) Smarter about reading and diagnosing coverages and knowing his hot receivers. Lost Hall and tight end Albert Okwuegbunam, his top two targets, for multi-game stretches last year and was throwing to a lot of inexperienced pass catchers by season’s end. Lock has a major-league arm, very good athleticism, great experience (including 31 starts vs. SEC defenses), a good head on his shoulders and is also still relatively new to football, not fully committing to the sport until high school. His top-end throws are as good as any quarterback in this class. Downside: Prone to head-scratching throws and interceptions, often when he tries to extend plays and make something happen when his first option has been ruled out. Can play a bad brand of sandlot ball at times and be too fast and loose. Overconfident in his arm strength and will try to thread dangerous passes into tight holes. Ball-handling has occasionally been suspect, and Lock’s hand size (9 inches) is right at the bottom end of many NFL’s teams’ cutoff point. Didn’t always perform as well in bad-weather games against good teams and worked primarily from the shotgun, which likely will lead to some learning time of how to effectively drop from center and read defenses from there. Not as efficient throwing short with touch and placement and can struggle in tight quarters. Must learn how better to throw fewer fastballs when they’re not called for. Missed far too many wide-open crossers for easy yards. In the red zone last season, Lock was only 22-of-52 passing (42.3 percent); although he had 14 TD passes and only two INTs in that area of the field, and he was coached not to take any sacks down there, it’s clear he’s not as dynamic and will need a lot of red-zone practice reps to improve. Best-suited destination: Even with his vast college experience, Lock would be best served going to a team where he is not asked to start immediately. He admitted at the Senior Bowl that he would have been lost, concept- and terminology-wise, had he declared early and not been able to work with Dooley in 2018. Lock profiles to a Year 2 NFL starter who has the arm talent to thrive in a vertical passing game provided he continues to progress on cleaning up the little things more thoroughly. Among the teams that appear most interested in his services include the New York Giants, Denver Broncos, Miami Dolphins, Oakland Raiders, Detroit Lions, Washington Redskins and Jacksonville Jaguars. Player comp: On the high end of the spectrum, Lock might have a Tony Romo-like career where he makes dazzling plays and earns Pro Bowl bids might never reaches the mountaintop. That’s darned good. On the low end, we could see a Ryan Fitzpatrick-esque profile: occasional brilliant mixed with maddening mistakes in the face of pressure. Consider that Fitzpatrick is a QB who has received starting opportunities from eight different teams, counting his newest one, the Dolphins. Others have mentioned Jay Cutler as a comp for Lock, too, and it makes a lot of sense. Expected draft range: First round, although don’t be shocked if he starts leaking into the latter parts of the round depending on how everything shakes out with the other quarterbacks and any trades that might occur.